Posted July 11, 2016 by Tony Jones & filed under Books. 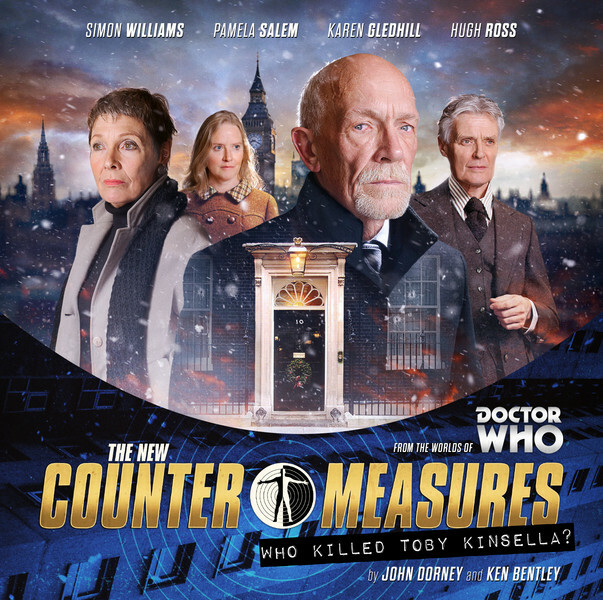 July 2015, and after four popular box sets, Big Finish killed off the Counter-Measures team. The only survivor from the 1960s spin-off from ‘Remembrance of the Daleks’ was Sir Toby Kinsella (Hugh Ross). Gone were Group Captain Ian ‘Chunky’ Gilmore (Simon Williams), Rachel Jensen (Pamela Salem) and Allison Williams (Karen Gledhill), and time has rolled by. It is now the early 1970s, power cuts, three day weeks, and Sir Toby’s turn to die. Design as a chance to provide a new jumping on point, and also to jump the series forward a decade, this kind of story needs to remind us of what has been, tidy up and loose ends, and introduce something new for those fresh to the series. Over two discs this set achieves those goals to varying degrees. The reminiscence is easy; one Sir Toby is dead up pop our three supposedly dead Counter-Measures team who were not dead at all. This gave plenty of chance for reminiscence, some comparison of the 1960s to the 1970s and a mystery. Who killed Sir Toby, what was he up to, and who is after Prince Hassan Al-Nadyr (Raad Rawi) a fried of Sir Toby’s from school? As investigations proceed, we find out about Sir Toby’s past, and that he has swept up all the loose ends from the first sets of stories. He has been so good, nobody knows who the Counter-Measures are. This brings them into conflict with MI5 in the form of Overton (Belinda Stewart-Wilson) who believes an assassination is in the offing and doesn’t know who are the good guys and who the bad. The two parts are written by John Dorney and director Ken Bentley. There’s plenty of action, intrigue and machination. John Dorney shows evidence of his work elsewhere on the 1960s Avengers series, and in some ways this set struggles to make the characters feel as though they have aged and could almost still be set in the 1960s with Cold War connivances and just a veneer of contemporary news. Perhaps this is reasonable, but in the form of Overton the new (and possibly returning?) MI5 operative, we have a character who wouldn’t be out of place in an episode of Spooks. She’s excellent but how much of the time is she? In this era we watched Softly Softy, The Avengers and Mission Impossible. We hadn’t yet reached The Sweeney so aren’t into Life on Mars territory (yet). Is this important? Perhaps not. Purist concerns aside, this is a great burst of energy for an already popular series, and we have to wait until December for the next four-disc release. Roll on the 1970s! Released in July 20156 by Big Finish Productions Ltd.